As Microsoft got into the swing of Build 2013, it shifted attention to Internet Explorer 11 during a press session here in the belly of San Francisco's Moscone Center. "The browser is no long a commodity," said Dean Hachamovitch, corporate vice president, Internet Explorer, to set the stage before a crew of IE team members ran down the forthcoming features. Following the morning's focus on Windows 8.1, now available in preview mode for download, the company said that IE11 preview is also out in the wild. IE11 will co-ship with Windows 8.1 and those who want to check it out now need the W8.1 preview build to get going. Microsoft drilled in that its looking to create "more than just a browser" as opposed to competitors like Firefox and Chrome, one that's tied to users' preferences, search habits, and that lessens device strain. The main thrust of the update is that it's optimized for touch. There's a "stick to your fingers" quality to IE11, Hachamovitch said, with features like hover menus, a touch-optimized address bar and more responsive swipe/pinch/tap control, all aimed at helping users browse through IE more snappily than before or on other platforms. 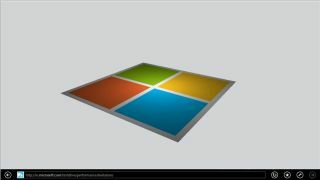 IE11 relies on the machine's GPU to process gestures and to accomplish offloaded image decoding, Microsoft said. A few company-run tests did show limited impact on a tablet's CPU and the company promised battery life takes less of a hit in IE11. The company added extra tab support in the updated browser, letting users have up to 100 tabs open per window. Again, a CPU prognosis shown by the IE team revealed little impact. Users will also see Favorite sites get added support. Folder and custom tile pics lend a personal touch. IE11 brings support for plugin-free HTML5 video, and thanks to more power efficient streaming in Windows 8.1, battery life for web video is supposedly stretched further than before. Unlike before, IE11 also supports interoperable WebGL, a graphics platform used to enable accelerated 2D and 3D graphics. The feat was achievable, Hachamovitch said, thanks to overcoming a security issue. IE11 scans for unsafe WebGL content and, working with the GPU, launches a software-based renderer to complement the graphic chip's work. A graphics subsystem failure, Microsoft noted, is no longer fatal. IE11 will also support Google's SPDY protocol, though WebRTC is out of luck. "We work very closely with the Xbox team and the phone team," he said. "Everything you see here, you can know that we're working together in a Batman cave in Redmond." "We've been very clear about our support for Windows 7," he said. Microsoft is feeling the need for speed with its product releases. See what we mean.